THE new age movement heralded by Theosophy in the late 19th century, is at last bearing meaningful fruit here at the opening of the 21st. “Theosophy is indeed the life, the indwelling spirit which makes every true reform a vital reality,” wrote the New Age’s original spokesperson, the inspirational and controvercial H. P. Blavatsky. What might be the practical value of these ancient doctrines today? Perhaps the primary importance lies in the assertion of our human-spiritual duality, i.e. the co-existance of awakened material (or psychic) and spiritual (noetic) entities in us. “‘We [assert] the existence of a higher or permanent Ego in us,” Blavatsky insisted. DR. LANI LEARY: “Dr. Lani Leary returns to Afterlife TV to share with us her extraordinary near-death experience during a routine dentist procedure. She explains how she left her body and saw it from above, visited with her deceased mother (a beautiful reunion), traveled through the infamous near-death experience tunnel, and finally became one with the Light (God/Source/Love). Dr. Lani Leary describes her fascinating near-death experience. Listen to the music Dr. Lani Leary talked about during the interview (very similar to what she heard during her near death experience). CONTACT DR. LANI LEARY: Dr. Lani Leary welcomes your questions or comments about this video and subject. If you have questions or comments for her, you can contact her at lanileary@msn.com. 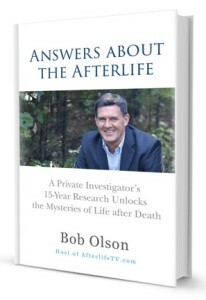 Let her know you saw the Afterlife TV interview with her. Buy Lani’s book on Amazon by clicking here..
Lani Leary, Ph.D. specializes in work with chronically ill, dying, and bereaved clients. She has worked for the past 25 years as a psychotherapist in private practice, as a chaplain in the intensive care unit of a hospital, and as a counselor in 6 hospices across the country. She served as the director of mental health services at an AIDS clinic, as a professor of Death Studies at George Mason University, and as a researcher at the National Cancer Institute of NIH. Lani has spoken nationally at over 250 conferences including the American Holistic Medical Association, Virginia Association of Hospices, Spirituality and Healthcare, International Sudden Infant Death Symposium, and Omega Institute of Holistic Studies. She is the author of Healing Hands, an internationally best-selling audio tape about therapeutic touch and complimentary approaches to pain management. She is certified in grief therapy, EMDR, hypnotherapy, and Critical Incident Stress Management. “At the solemn moment of death every man, even when death is sudden, sees the whole of his past life marshalled before him, in its minutest details. For one short instant the personal becomes one with the individual and all-knowing Ego. “But this instant is enough to show to him the whole chain of causes which have been at work during his life. He sees and now understands himself as he is, unadorned by flattery or self-deception. He reads his life, remaining as a spectator looking down into the arena he is quitting; he feels and knows the justice of all the suffering that has overtaken him. This entry was posted in Afterdeath Experience, Brain, Mind, Consciousness, & Beyond, Health, Healing, & Wholeness, NDE, Psychology & Human Nature, Reincarnation & Karma and tagged consciousness, god, karma, mind, psychic, Reincarnation, spiritual. Bookmark the permalink.